As a rule, Ireland on its east coast (sharing the waters of the Irish Sea with England) is largely industrial. Ireland on its west coast, however (sharing the waters of the North Atlantic Ocean with America), is largely unspoiled. The county of Antrim (from the Irish, Aontroim, meaning “lone ridge”) is beautiful in its own way. Belfast, hardly renowned for its natural beauty, is located here. But so is the Giant’s Causeway, one of the most interesting coastal landscapes in the world. The Glens of Antrim, which roam to the coast and shine like beacons in summer, are designated Areas of Natural Beauty. Rathlin Island, at the northernmost point of Northern Ireland, only 15 miles from the Mull of Kintyre in Scotland, is one of only 43 Special Areas of Conservation and is home most impressively to the penguin-like Common Murre, Atlantic Puffin and Razorbill families of birds. Additionally present on the island is a herd of seals that lingers about the rocky coastline in search of sun. Lough Neagh, the largest lake in Ireland and the 31st largest in all of Europe, features considerably in County Antrim, where it can be met from the well-established Lough Shore Parkin Antrim town, or from the intriguingly rustic backwoods of Randalstown Forest. Ram’s Island, about one mile offshore, preserves in miniature the history of Ireland, and contains the ruins of the O’Neill’s 19th century summer house and round tower. Cumaighe Ua Floinn, son to the Lord of Durlas (Antrim was once named Durlas), was drowned here in a battle for the island during the 12th century, and during the Second World War it was used as a station for the American Air Force. The encroaching scenery at Slemish is renowned as the dwelling place of St. Patrick, who was enslaved there during his youth by Irish raiders. Essentially a spasmodic cluster of stepping stones, the Giant’s Causeway (Clochán an Aifir in Irish) was created in the aftermath of a volcanic eruption 60,000,000 years ago and is made-up of around 40,000 interconnecting basalt columns, which on the surface form a consistent network of joint hexagonal and polygonal patterns. Local legend begs to differ. According to the tale, an Irish giant named Finn McCool lifted the earth to throw over to Scotland, creating a pathway for a rival giant. Outwitted, this giant tore back to Scotland, wrecking the earth as he went. Fingal’s Cave, on the uninhabited island of Staffa, is named for him. 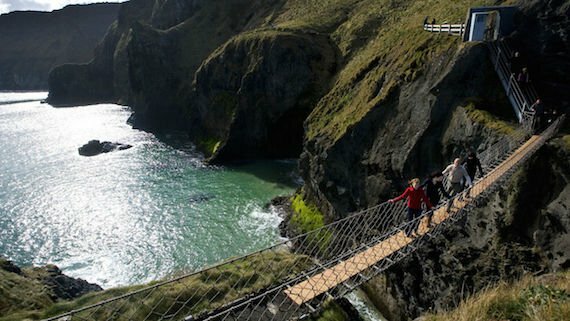 A nearby rope bridge extends the uncommon beauty of the place and links the mainland with the defunct fishing island of Carrickarede, a designated Site of Special Interest for its unique geology, flora, fauna and seascape. The lesser-known Loughareema Vanishing Lake near Ballycastle, which lies on a bed of chalk and peat, does exactly this: it literally vanishes and reappears, within a few hours. The road that runs 120 miles from Belfast to Londonderry comes highly recommended to drivers eager to undertake the majestic scenery of the north coast. For everyone else, there’s the Giant’s Causeway and Bushmills heritage railway, which travels along the stretch of the coast that connects the Giant’s Causeway to the 17th century historical village of Bushmills. The railway itself was first opened in 1883 and then dis-mantled in 1949 before it was re-assembled and re-opened in 2010. Most tourists, however, visit Bushmills for the internationally renowned Old Bushmills Distillery, which at over 400 years old is the oldest licensed distillery in the world. There are a few tours that go to the Giant’s Causeway. Pick the one that fits your needs the most and book now! 9. The Giant’s Causeway visitor centre (Opening Times: Monday to Sunday from 9.00 a.m. – 6.00 p.m.) Prices: Adults £8.50 / Children (5 – 17 years old) £4.25 (Children under 5 go free) / Family (2 adults and 3 children) £21.00 / Please note: the causeway is free and accessible to the public all year round. However, parking is limited to the visitor centre car park, wherein visitors are encouraged to buy costly tickets to the welcome centre.